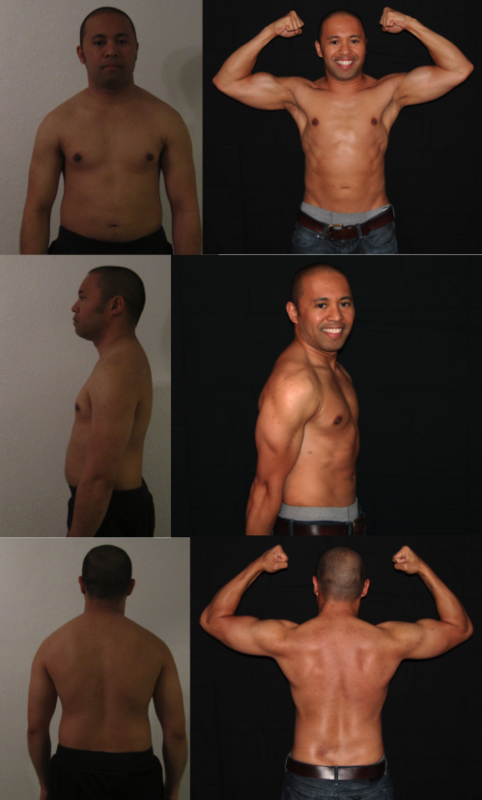 Today John talks to Richard Tesorio who placed 8th in our last 12-Week Transformation contest. Richard’s 12 week midterm results. Richard graduated high school at 115 pounds soaking wet. Naturally skinny, he was constantly trying to bulk up. He always wanted that big, ripped defined body. So one day he started working out with a friend who had him been involved in some badass tactical operations. However, as awesome as that may sound, he couldn’t even walk home after his first workout. Richard decided to get a new trainer, however this guy was Somalian and just freakishly strong. Even though he got some results, there was no end goal to his training. It was at this time Richard hit an all-time low; he simply stopped going to the gym. Finally, with a renewed vigor he resumed his workouts, still chasing his dreams of attaining the ever so elusive ripped physique. He knew of the Adonis Index System as early as 2008, but busy with life, he never applied himself to the workouts. Before fully committing to AI, Richard tried running, cardio and insanity workouts…he was stuck in a cycle of hopping from program to program, not getting any results. To make matters worse, although he recovered from a thyroid issue, he made no changes to his diet which ballooned his weight from 115 to 140 pounds; his weight gain finally leveled off at 159 pounds. Now burdened with the unwanted bulk from his weight gain, Richard tried a few diets, but hadn’t yet learned the concept of calories in and out. He also had no understanding of body shape, he would lose weight, only to become a smaller version of himself and not the better looking version, as he hoped for. He was very unsatisfied with his physique, however, since he was still getting the Adonis Index emails and had the program, he finally decided to commit and try this Adonis thing. Richard’s initial approach to the Adonis Index workouts was very smart. Before he started worrying about big gains he just wanted to get into the habit of going to the gym. In the evening there’s simply too many people, so he figured that mornings will be less crowded and more equipment will be free for him to use. At first he was like everyone else comparing himself to other people, but you know you shouldn’t do that, and like Richard said, looking back most of these people don’t even know what the hell they are doing. Once he figured out that he needed to focus on himself, he started learning the moves and focusing on the lift with lighter weights. He basically gave himself a permission to lift light at first. By learning the proper techniques he progressed quickly without getting injured in the process. Richard starts his mornings with water and black coffee and performs his Adonis Index workout; he then fasts until 5:30PM. This routine is in accordance with most people’s schedules so he is able to remain social at events that normally occur in the evenings. A typical diet normally involves some sort of restriction, but most people try to restrict too much, because they strive for quick results. Sadly, this is a proven method for failure. The goal should be to make that restriction feel as minimal as possible. You can have sweets and cupcakes, it doesn’t matter as long as you restrict calories and have some balance in your diet. However, be prepared for some resistance. Because it looks crazy if you are eating “junk food” in public, it doesn’t make any sense to them that you could be eating like this and be following a supposed fat-loss diet. In the grand scheme of things. that donut is insignificant; no one knows you fasted for 16 hours and will finish with a medium-sized dinner. They’ve had their two meals already and plan on having another two, so if they ate a donut they know it might be too much fattening food for them. In conclusion, although Richard’s Journey was filled with many peaks and valley’s, his lessons learned in consistency and accountability led him thru a successful 12 week Transformation. You need to get used to the idea that the progress will get slower, don’t get attached to the speed that happens at the beginning, we all want it quicker, but that’s why people rebound when they try to make quick progress. Andrew Peter’s interview and pictures – Commitment Equals Results, So Are You Committed Enough? I first heard about the Adonis Index back in 2008 through Brad Howard who was doing some dating advice for men with a guy named Scot McKay. So in November 2008, I signed up for the Adonis program, got beta access to the forums and workouts. But, I put it away because I was busy with life at the time.